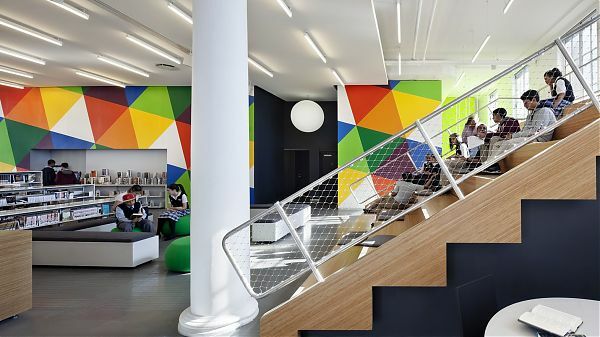 Hamilton Grange Library teenspace, by Rice+Lipka Architects. Photo by Michael Moran. In 1978, South Kingston High librarian Linda Wood decided to remake a room at the Rhode Island school into something she called the Un-Commons: a furniture-less room with cushions on the floor, album covers mounted on the walls, 10 headphone jacks, and stacks of paperbacks, from science fiction and fantasy to mystery and romance. Teens with a free period could choose a record, sign out headphones, and just chill out. The books didn’t even require a sign-out slip. Forty years later, Wood’s son Dan would have his chance to make an Un-Commons: a teen corner, tucked behind a bookshelf, at the back of the Kew Gardens Hills Library, in Queens, designed by his firm, WORKac, and opened in 2017. “The teen space was one of the reasons why they wanted to expand the library; it was the only new program they were adding,” he says.